Everyone loves wireless over-ear noise cancelling headphones from Bose, but not everyone wants to spend $350… especially when there are a bunch of great options these days that cost a small fraction of that amount. Case in point: the TaoTronics Active Noise Cancelling Bluetooth Headphones. 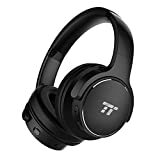 They normally cost just $55 on Amazon and they provide great sound, impressive active noise cancellation, and up to 30 hours of continues music playback on a single charge. Use the coupon code BGRBH040 at checkout though, and you’ll pay less than $43!